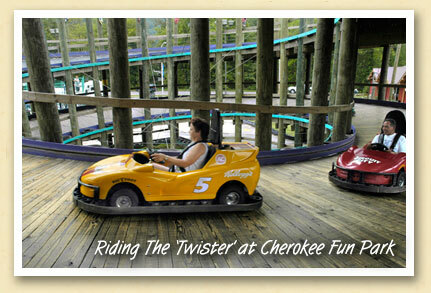 The ‘Twister’ — one of the two go-cart tracks at Cherokee Fun Park — is a multi-level figure-8 spiral that winds its way up one side of the “8” and back down the other. The park’s other track is a more traditional road track with two overpasses. There’s also miniature golf and an indoor arcade. The Cherokee Fun Park is located at 1897 Tsali Boulevard (US 441N) at the Acquoni Road intersection. Hours are 10am to 10pm seven days a week throughout the summer season (Memorial Day — Labor Day). This is our fourth birthday — Since May 26, 2008, we’ve published 216 Postcards From The Smokies. If you’re relatively new to this blog, you may enjoy browsing through our past posts… a composite picture of living and playing in Bryson City and the Great Smoky Mountains.